You're a mean drunk, Superman. "It threw a forklift truck like it was a SOFTBALL! It was the most powerful thing I've ever seen." Likely the most primal super-power. In a way, it's one of the oldest "super-powers" that mankind came up with; ancient myths have plenty of tales about mighty warriors and demigods, apparently normal humans but with strength beyond any human limits. Very common power from the Silver Age. Usually does not know Kung Fu. Usually, this is the linchpin power of a Flying Brick. Characters with a wide variety of Superpowers will very frequently include this as a baseline ability. Characters with super strength may demonstrate it with a Neck Lift. A must for The Big Guy. This is also the most common Charles Atlas Superpower. A source of strength could be Uninhibited Muscle Power. See also World's Strongest Man and Required Secondary Powers. Villains show this off with a Neck Lift, Minion Maracas, Barrier-Busting Blow, or Hoist Hero over Head; heroes do it by being a Load-Bearing Hero. Characters with this power may sometimes not know their own strength. They are often described as having The Strength of Ten Men. Children with this power have their own trope, as do characters with big stomachs. The Motu Patlu episode "The Bulk" is about Motu getting injected with a serum that makes him larger and stronger. The CG-film version of Beowulf (2007) certainly implied that the title character has beyond normal strength and fortitude. As he should: The original poem states that he had the strength of 30 men in each arm. In The Hunchback of Notre Dame, Quasimodo is quite strong for a man of his size. Some of his feats include picking up an armored with one hand, sliding a massive stone slabs aside, scaling a catherdral wall with one hand while carrying Esmeralda and Djali in his other arm, and even breaking down brick walls. Mr. Incredible from The Incredibles has super strength and (apart from some degree of implied invulnerability) that's pretty much it. It's actually quite a hassle at times, because if he doesn't concentrate on keeping it in check he can accidentally saw a plate in half when cutting his steak or indent his fingerprints into his car, and the only way he can believably work out is to rig up an exercise machine with entire locomotives used as weights. On the bright side, it's great for lifting up the couch so his wife can vacuum under it. Tai Lung from Kung Fu Panda: Having a giant boulder hanging on a chain from each paw was not enough to restrain him, he sends rhinos flying like rag dolls and tears a piece of stone bigger than himself from the temple's stairway to hurl it at Shifu; he distinguishes himself even in the world where unnatural strength automatically comes with kung fu mastery. Tigress also has this. It caused the poor cat serious problems when she was a cub, because she couldn't control it and accidentally injured the other kids (all prey animals) at her orphanage when trying to play. Shifu eventually took her in and taught her restraint. Oddy from The Legend of the Titanic is strong enough to throw whole icebergs. Later on, he's shown to be strong enough move the Titanic, up to and including putting it back together after it gets split into two pieces. However, he can't pick up a bathysphere from the ocean floor. Than again, said bathysphere was probably wedged into the ocean floor. One of Stitch's powers in Lilo & Stitch. He is stated to have the capacity to lift 3,000 times his own weight (which, granted, is seemingly lower than that of a grown man). The series played with this by saying that this was the exact amount he could lift: Gantu flicks a piece of paper onto a heavy weight Stitch is holding up and Stitch immediately collapses. Implied in The Little Mermaid when Ariel manages to move an underwater boulder (most likely sealed shut with an imbalanced volume on both sides) blocking her Grotto with relative ease. It may have been that the rock was hollow, or simply that it was lightweight due to being in the water, although for that to be true it would have to be at least somewhat hollow from inside. Or it could simply be an animation goof in terms of weight. Gloria the hippo from Madagascar can smash through brick walls. This makes sense, because she's a hippo. Ginormica from Monsters vs. Aliens has Super Strength as side-effect of her growth in size, able to muscle her way through an energy field, punch through enormous metal doors and lift a falling chunk of machinery that probably weighs a good 500 tons. Starting in My Little Pony: Equestria Girls  Legend of Everfree, the human Applejack gets super strength as a unique power. For example, she can lift a post that several people had to work together to lift and then hammer it in with one hand. The title character from Wreck-It Ralph can smash more then just windows. For instance, he easily splits a jawbreaker that Vanellope says is indestructible and trashes most of the racing stadium. Hercules, Samson, Gilgamesh, and a host of other heroes from legend and myth have all had it. Likewise for virtually every ancient myth's gods. Folk tales and tall tales get on it too,of course, with giants or just strong people. Some of the more famous ones include Paul Bunyan, a giant lumberjack and owner of a lumber company so strong he could bash mountains with his fist, Pecos Bill, a cowboy who could hug a bear to death while a young kid, and lassoed a cyclone to get the rain out, and various other legends of giants in folklore. Mutants & Masterminds separates this out from enhanced strength. Enhanced Strength applies to all abilities using strength such as increased lifting capability, melee damage, and skill checks and for all practical purposes, just directly increases your strength score. 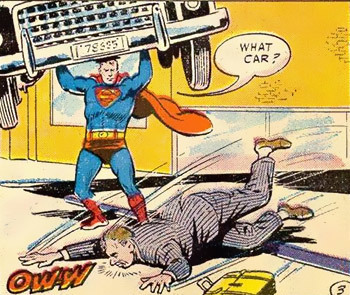 Super-strength only applies to lifting and "feats of strength" involving sustained force like forcing open doors, grappling, etc, but is available at a fifth of the price. It's also traditional used for power stunts like super-breath, Ground Pounding, and the like. The reason for this is that a raw Strength score so high the character could do things like lift a freight train would be a Game-Breaker of epic proportions, so it was mechanically easier to create a separate power for increasing carrying capacity and the like. Third Edition just uses Enhanced Strength (Limited to lifting), due to the greatly accelerated progression of carrying capacity. The game lets you buy Lifting or Striking strength separate from normal strength. To simulate people like Superman or the Hulk the Super Effort enhancement increases normal strength exponentially when you really need it. GURPS newsletter Roleplayer #10 (May 1988), adventure "The Isle of Night". The Eldritch Abomination T'Soquat has a strength of 300, which is fantastically high by the game's standards. When it hits it does approximately 30-180 Hit Points of damage. Potence gives vampires supernatural strength. On strength rolls, each level of Potence adds an automatic success. Ghouls also get Potence automatically. Vampires can temporarily augment their strength using their vitae. This can give even the most noncombat-oriented vampire the strength of a powerlifter for a short time. Strength gained in this way must be rolled in strength checks like normal, however. In Vampire: The Requiem, Potence is replaced with Vigor, which does pretty much the same thing. The Paramount Strength gift in Nobilis. You can also take it as an Affliction, in which case you won't know your own strength. In the Hero System, this is simply a matter of having a high enough Strength stat. Every +5 doubles the amount of weight the character can normally lift (an average human in good shape at STR 10 is considered able to briefly lift, if not really move with, up to 100 kilograms or about 220 pounds; thus, the usual by-the-book human maximum of 20 is already four times that), and Strength is pretty cheap as characteristics go (one character point per +1, twice that past 20 for "normal" people). As a result, superstrong "brick" characters are a perennial stock archetype especially in the superheroic genre where normal human characteristics maxima don't apply. In Dungeons & Dragons, there are many races that are physically stronger than humans. The classic examples are dwarves and orcs/half-orcs. After twenty years of slavery in salt mines and shipyards for stealing a loaf of bread, Jean Valjean of Les Misérables is capable of superhuman feats of strength such as singlehandedly lifting shipmasts and fallen carts that dozens of men can't even budge, and carrying loved ones across his shoulder to safety effortlessly while running at a brisk pace. Granted by the Mask of Strength. Different Kinds of Toa have a degree of it ingrained naturally. The Makuta all posses it. Some Characters with impressive strength include Nocturn, Takutanuva, Tren Krom, and especially Mata Nui. It's justified for that last one; he's actually a Humongous Mecha . In fact, Word of God has stated that the average Toa would probably be capable of lifting at least a ton, without any help from their masks. Toa of Stone, Earth, and Iron are stronger still. In Fate/stay night all Servants are notably stronger than humans, but two stand out even among Servants. Berserker is insanely strong, as a result of Mad Enhancement increasing Hercules' already spectacular strength. Rider has the ability Monstrous Strength, which increases her strength at the cost of slowly transforming into the Gorgon. Inverted in Tarot Cards with the Major Arcana Strength, that despite usually showing a woman holding open the jaws of a lion (don't try that) with no effort represents self-control and gentleness over brute force. In some interpretations, the inverted Strength card plays it straight.